Hey guys, Matt here with a quick update! 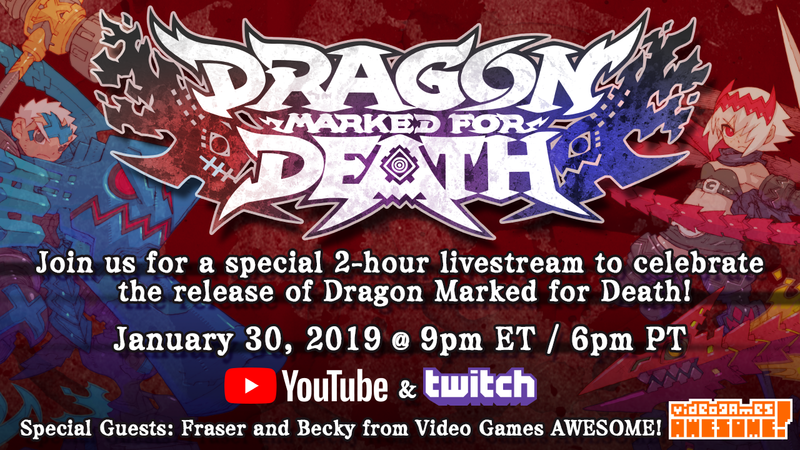 To celebrate the release of Dragon Marked for Death on January 31st for the Nintendo Switch, we’re holding a special 2-hour livestream on the eve of the release date to celebrate with you folks! I’ll be joined by fellow Inti staff Andrew, and by two very special guests, Fraser and Becky from the legendary “Video Games AWESOME!” channel. 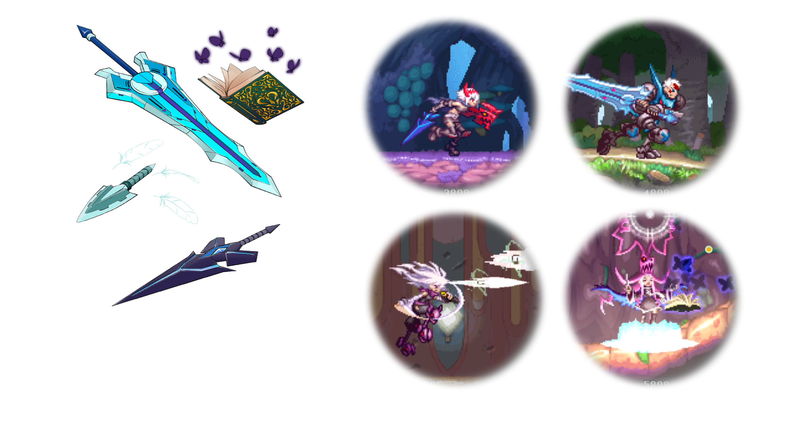 I’m so glad that we will be able to showcase some LIVE 4-player Dragon Marked for Death action, so come celebrate the release with us and get a taste of what the game truly has to over before it releases on January 31st! It’s still not too late to pre-purchase the game on the Switch eShop to make sure you can get your hands on the Striker Gear, a pack of weapons that can only be obtained with the digital version of the game by pre-purchasing it up through January 30th. 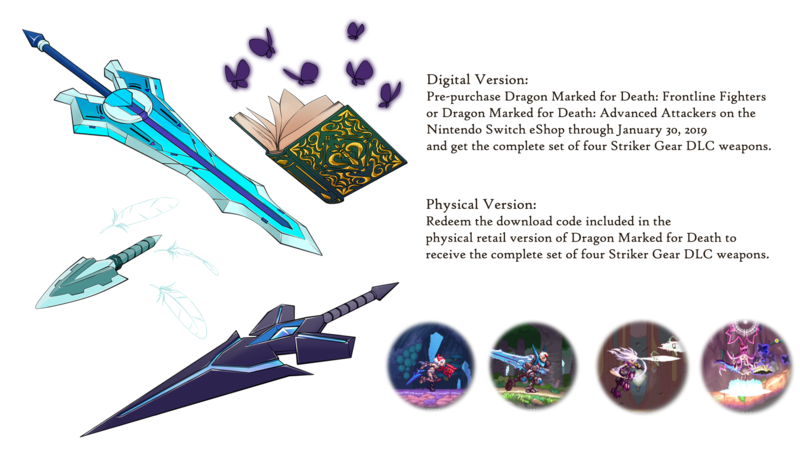 You can pre-purchase Dragon Marked for Death: Frontline Fighters (Empress & Warrior) here and Dragon Marked for Death: Advanced Attackers (Shinobi & Witch) here. We have a two-for-one special of Dragon Marked for Death information today! First up, Dragon Marked for Death is now available for pre-purchase on the Nintendo Switch eShop in Europe! Folks in North America and now Europe can obtain the Striker Gear pack by ordering the game through January 30th. We are happy to announce that we worked with a wonderful group of voice talent here in Japan to bring the Empress, Warrior, Shinobi, and Witch to life! Each character has four different voices recorded by different actors, and players will be able to select whichever voice they like to give their character their own unique spin when creating their character. Let’s meet the voice actors! The release of Dragon Marked for Death is almost upon us, and now the game is available for pre-purchase on the Nintendo Switch eShop in North America! (pre-purchase opens in Europe on Jan. 17th) Let’s take a closer look at how the game is being sold digitally, and get an overall look at what’s on the table for this game! Merry Dragon-mas everyone! As we wrap things up here at Inti Creates HQ and start our holiday break, we bundled up a bunch of Dragon Marked for Death announcements to share with you!